After spending an appropriate amount of time recovering from New Year’s Eve (keep in mind that teaching generally gives me a 10 pm bedtime so even staying up until midnight was being bold), Gargi and I started our day. 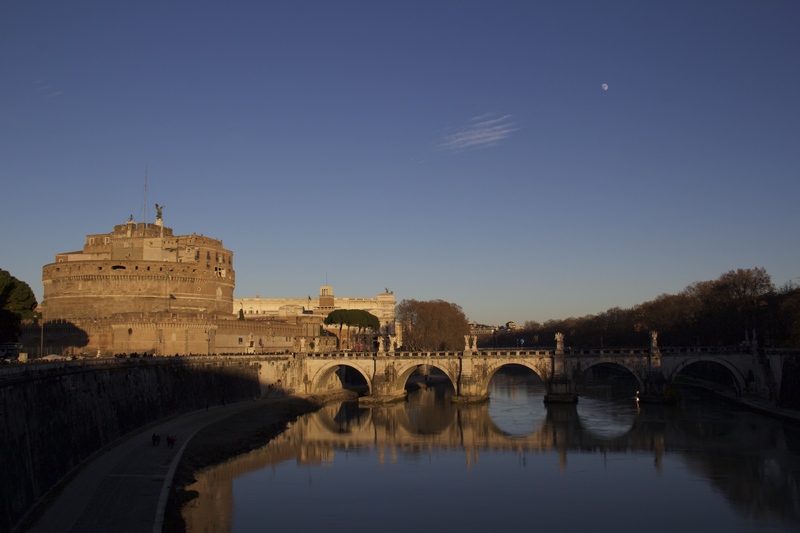 To my great relief, most of the major sights in Rome are closed on New Year’s. Now you might be wondering why I was happy about this fact, but to be honest after about two weeks of travel I was pretty content to have a rest day. 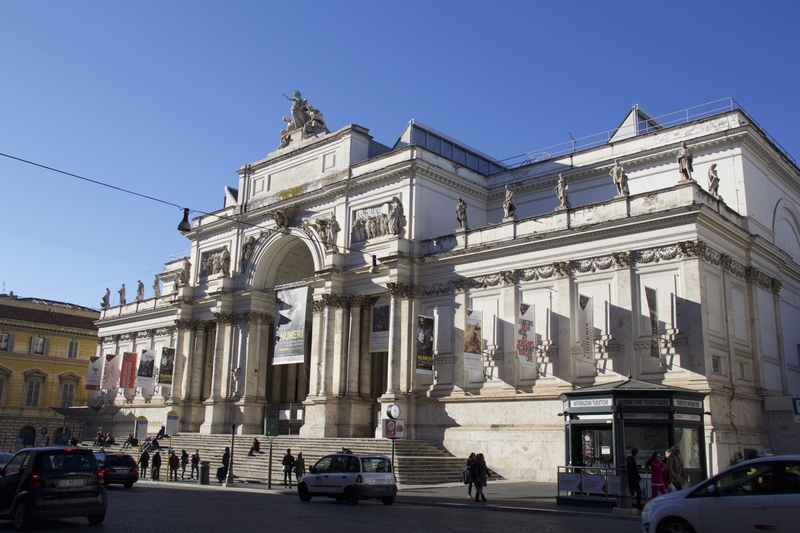 Now before I go on to detail the rest of my time in Rome, I’m going to state right off the bat that I arguably didn’t do Rome “right.” Enough of my friends have gone to Rome that I have a nearly endless supply of advice on the city. I freely admit that I ignored most of it. I did not eat gelato every day (just most days), I did not eat pasta/Italian food for every meal, I did not make any sort of reservations in advance, and I did not book a tour to anything. 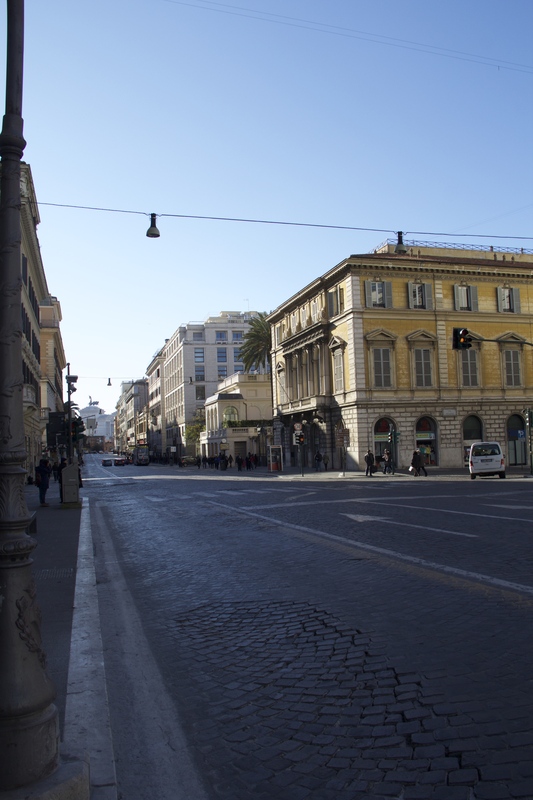 In short, my trip to Rome mostly consisted of me just walking around and discovering things. But hey, it worked for me. I will say that one huge benefit of all of the advice that I got was that I never expected to visit everything. 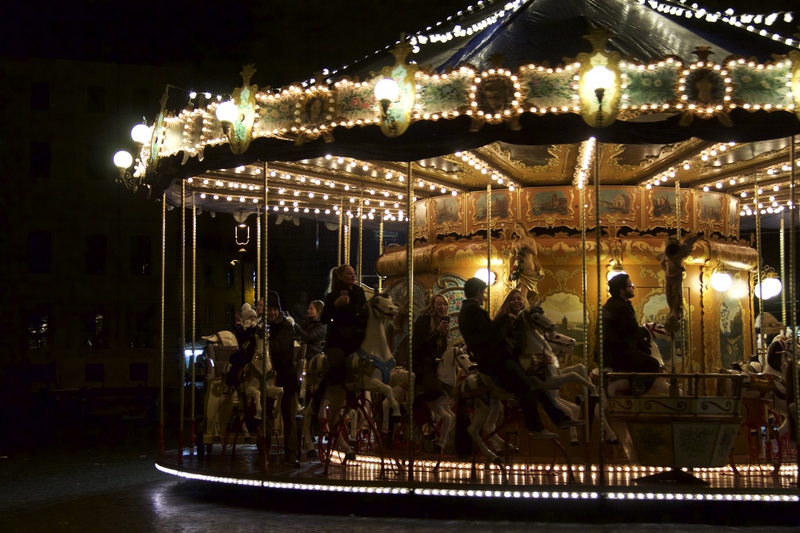 Being overwhelmed with attractions just meant that I was content to take things at a more leisurely pace. Now back to New Year’s. 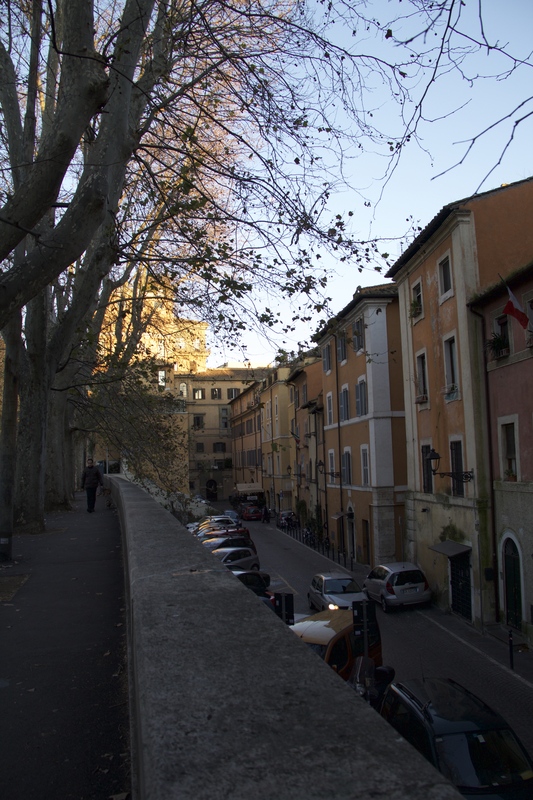 I will say that one of the great things about Rome is that chances are you are going to stumble upon something beautiful. 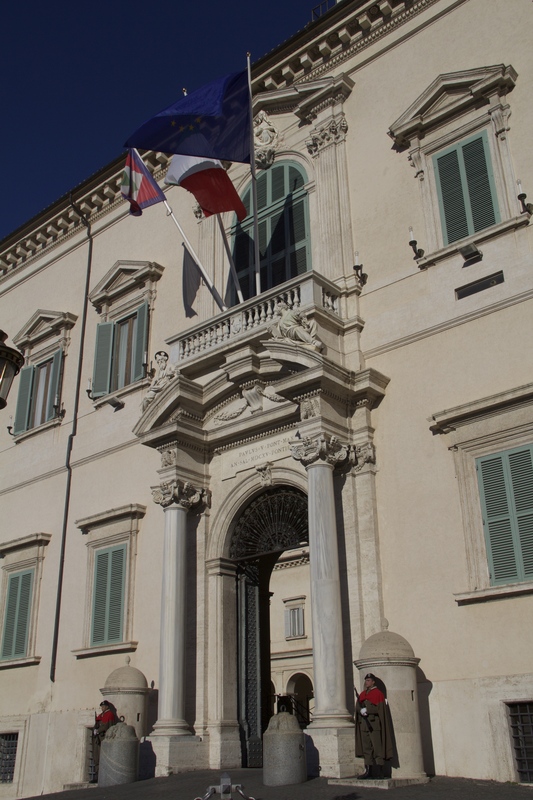 My late morning wander with Gargi accidentally led us by the Palazzo Chigi, or the official residence of the Italian Prime Minister, and from there it was just a hop, skip, and a jump to Trevi Fountain. 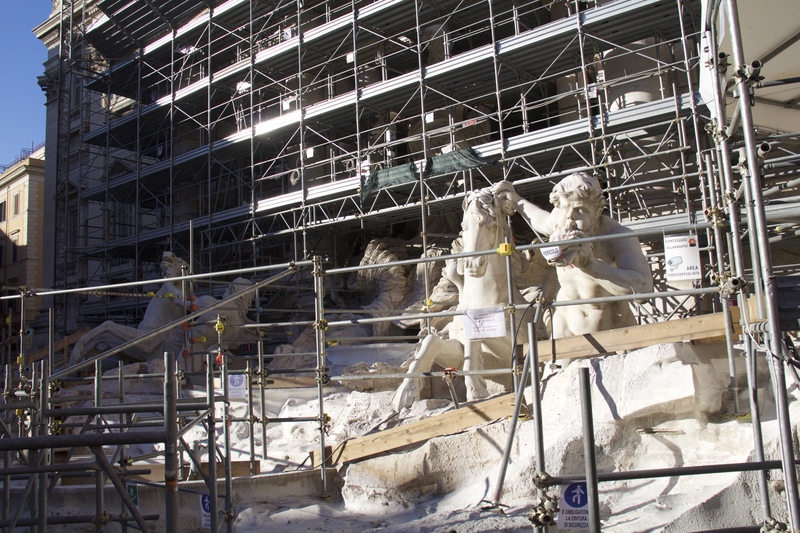 Luckily I’ve known for a while that Trevi Fountain is undergoing restoration work, so I wasn’t surprised to see the fountain dry and covered with construction work. 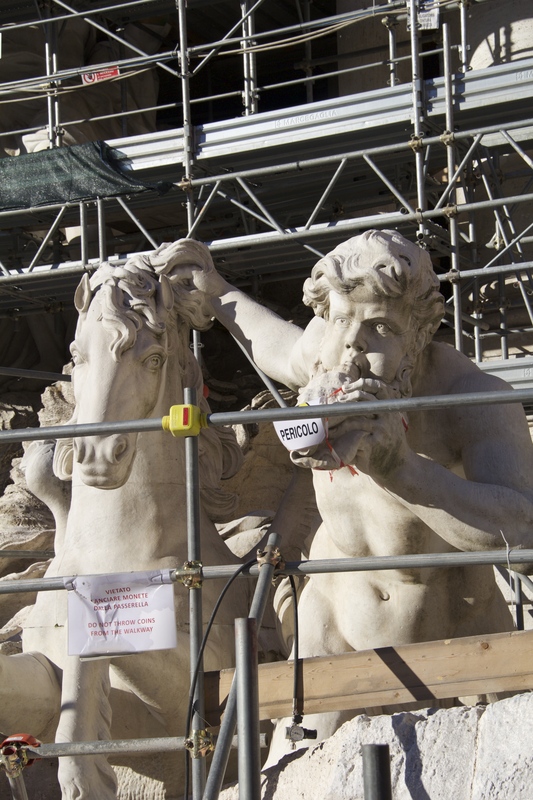 The one huge advantage of this is that you can actually get quite close to the fountain’s sculptures. 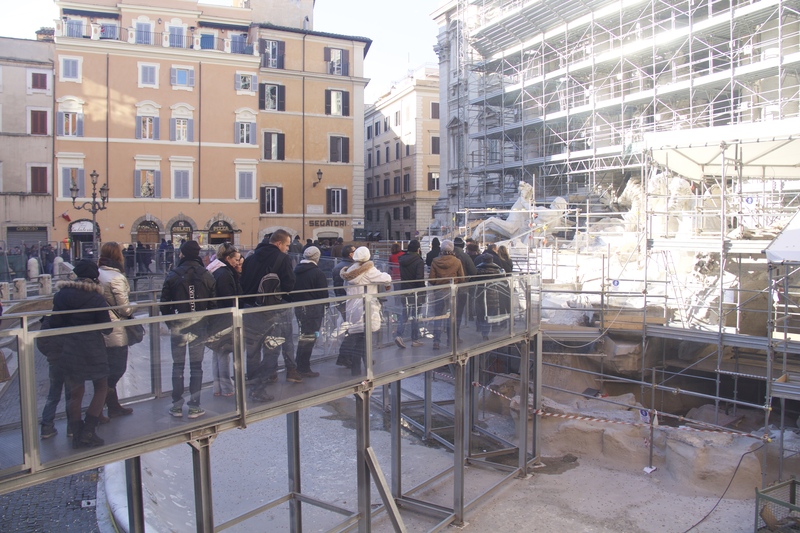 Now like most fountains, it’s not uncommon for people to toss coins into Trevi Fountain; however, at Trevi Fountain there is a particular tradition associated with how you toss in coins. Now no one disputes that throwing in one coin is supposed to help you return to Rome. Gargi then told me that throwing in two coins is supposed to result in a marriage, while three coins results in a divorce. But the meaning behind the second and third tosses is a bit disputed (some people say two coins is supposed to bring a new romance while three coins brings marriage); however, by the time the two of us had even remembered the coin toss we had left the fountain and were focused on finding lunch. We were successful in our quest and eventually came across a pretty good pizza joint. 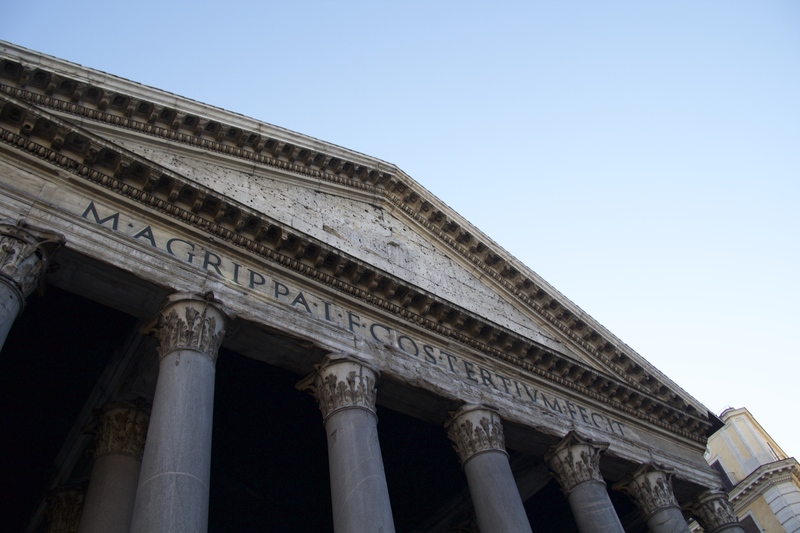 Once we finished we hit the streets, this time to visit the Pantheon. 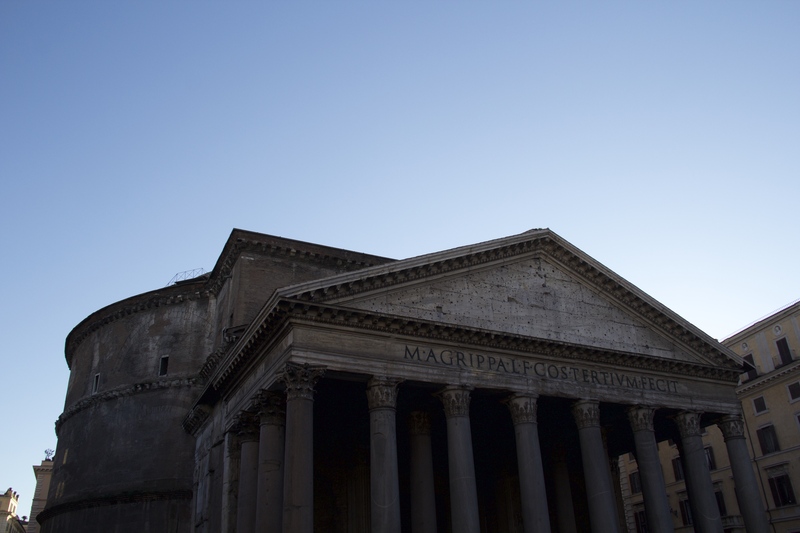 Again because it was New Year’s the Pantheon was closed, but I had a good time snapping a few pictures before heading off to our next destination. 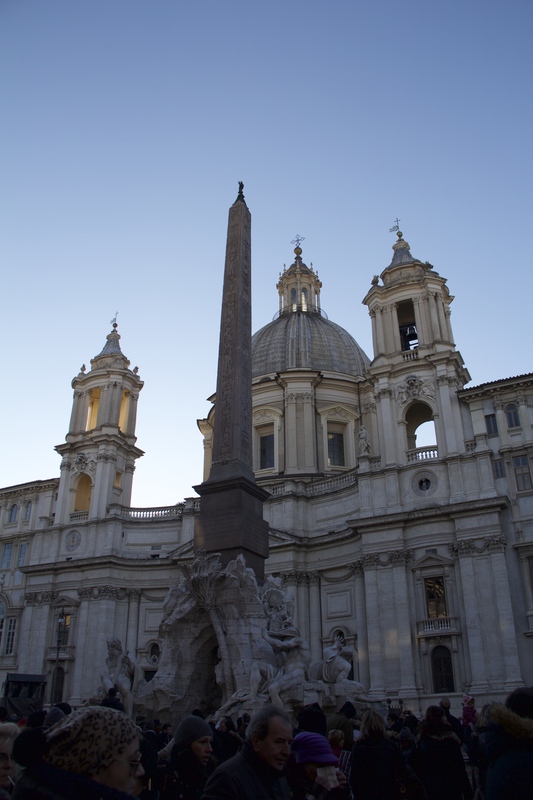 Only a few blocks West of the Pantheon is Piazza Navona. 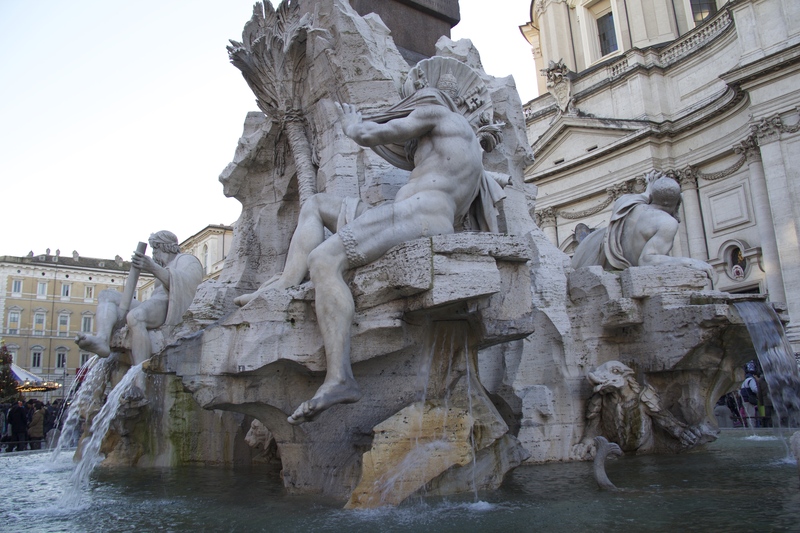 Now if any of you are Dan Brown fans you might recognize Piazza Navona as the place in Angels and Demons where Bernini’s Fountain of Four Rivers is located. 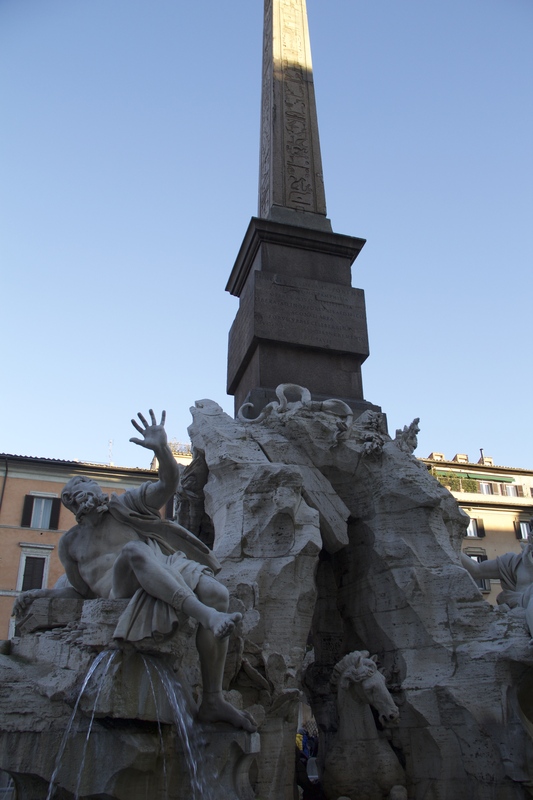 I happen to be a Dan Brown fan so I was excited to see the fountain in person. 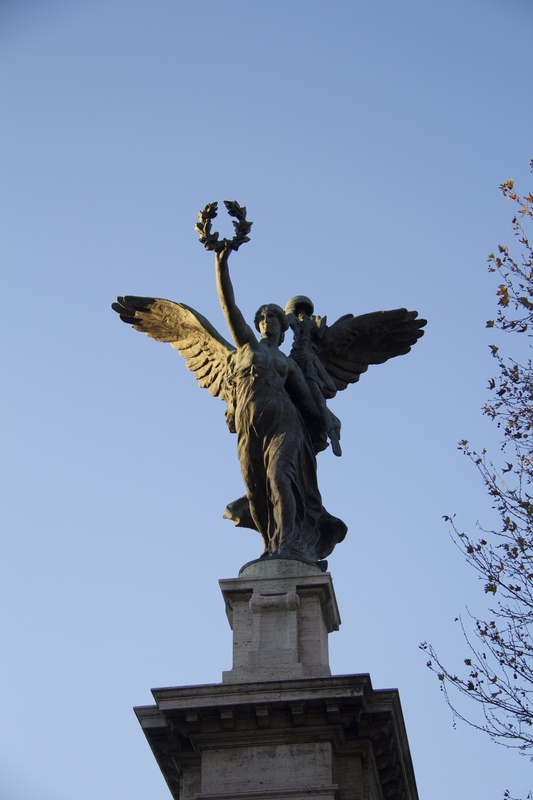 If you happen to visit you will also notice that the fountain is fairly shallow, making the drowning scene in Angels and Demons hard to believe. 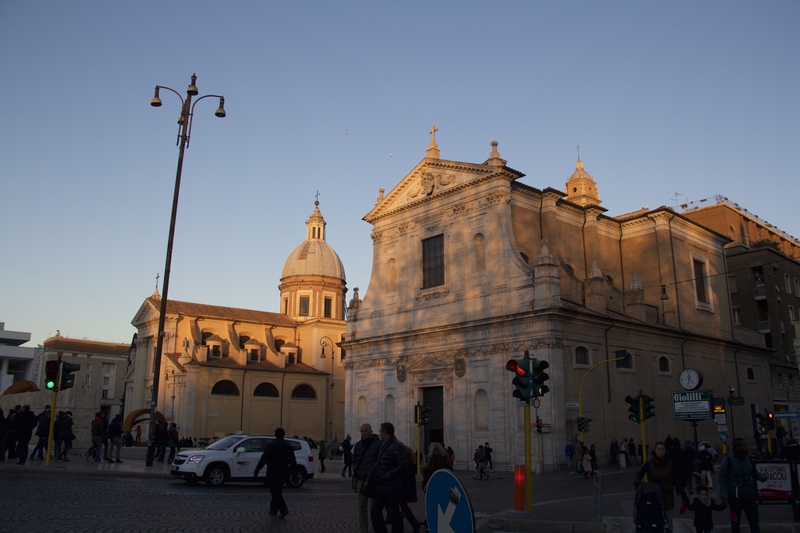 The other fun fact that Gargi pointed out is that if you look carefully at the Bernini figure facing the church Sant’Agnese in Agone, you will notice that the figure looks noticeably in pain (granted most of the other figures do too, but this one looks a bit more tragic than the rest). 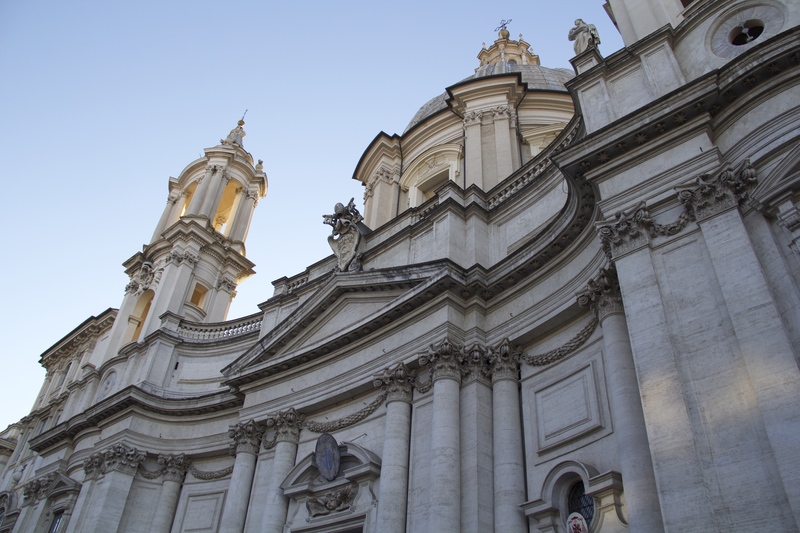 Gargi then told me that Borromini was one of the architects of Sant’Agnese and that he happened to be great rivals with Bernini. 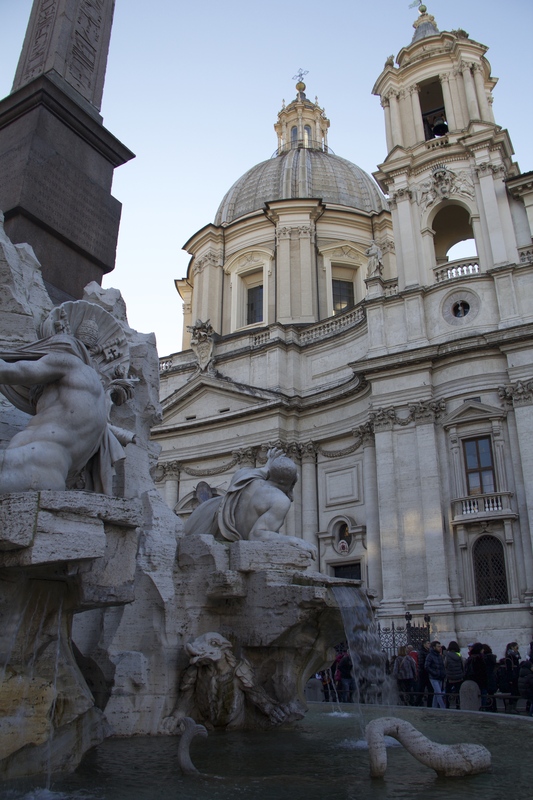 Apparently Bernini in an act of vengeance has this figure shielding his face in order to convey the idea that Borromini’s building was so ugly that not even his statue could bear to set eyes on it (check out the bottom row of pictures). 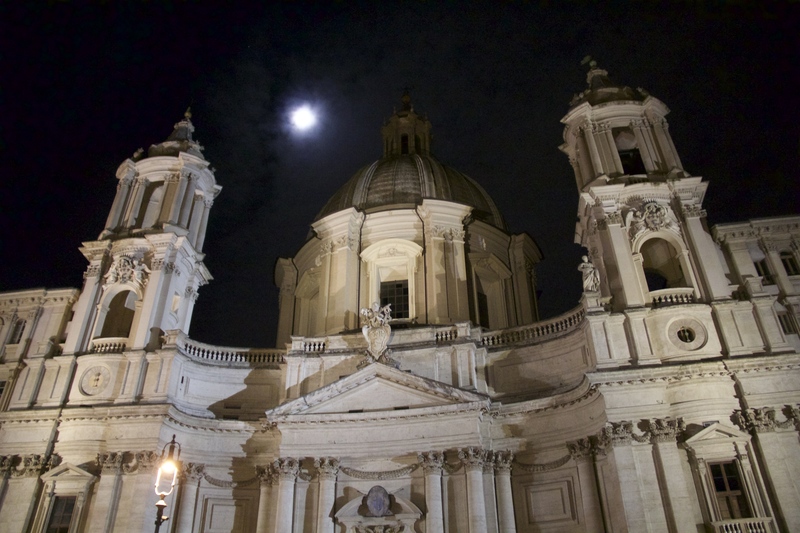 Now I’m not sure I would agree with Bernini on whether or not Sant’Agnese is ugly, but I found the story highly entertaining. 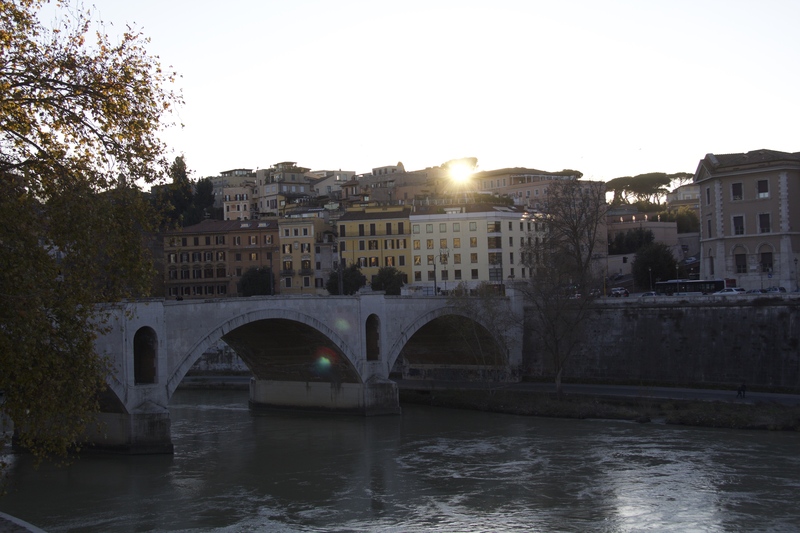 From there we walked by the Tiber River until we got word from the boys that they were awake and properly fed. 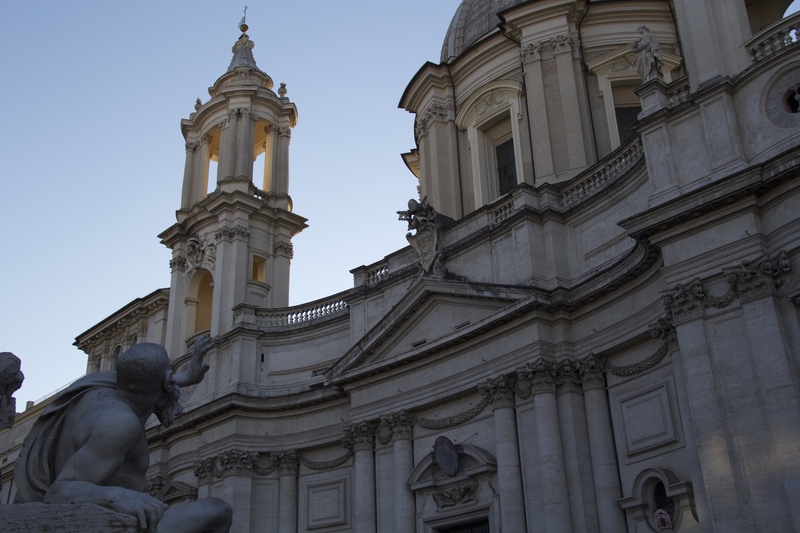 We decided to meet them by the Spanish Steps and set our feet in that direction. 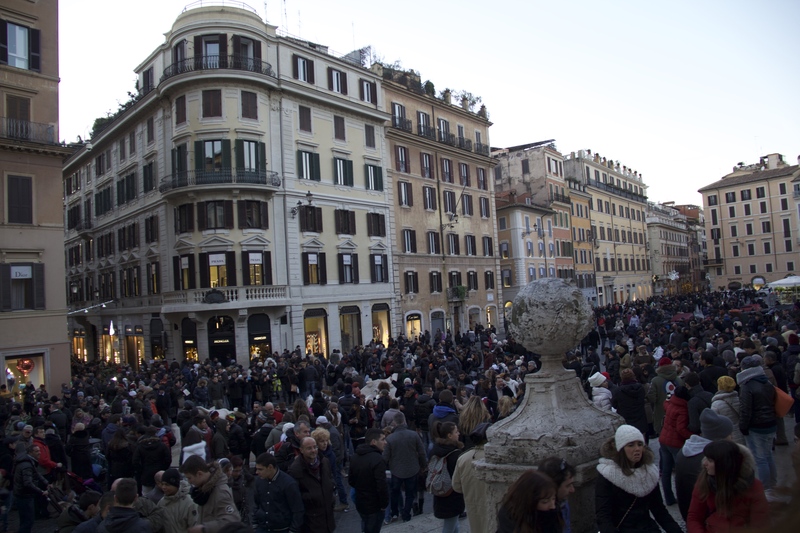 When we made it to Piazza di Spagna it was absolutely packed. 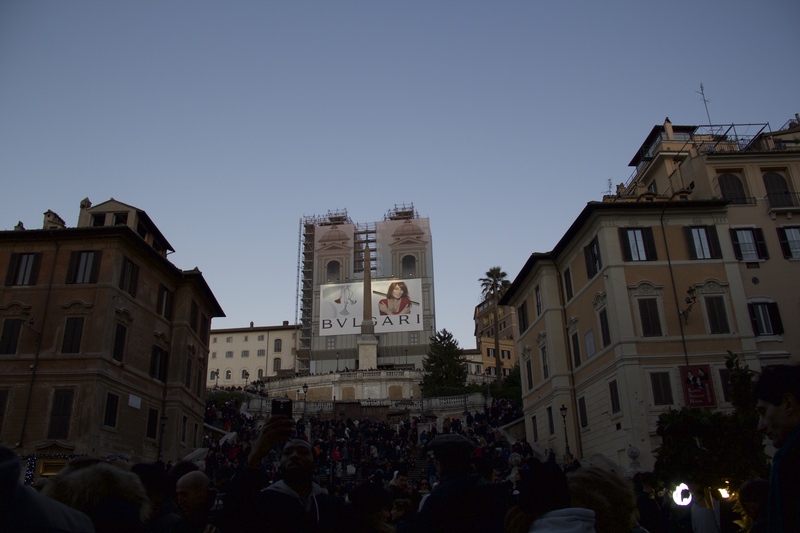 You could barely see the Spanish Steps due to the number of people standing on it. 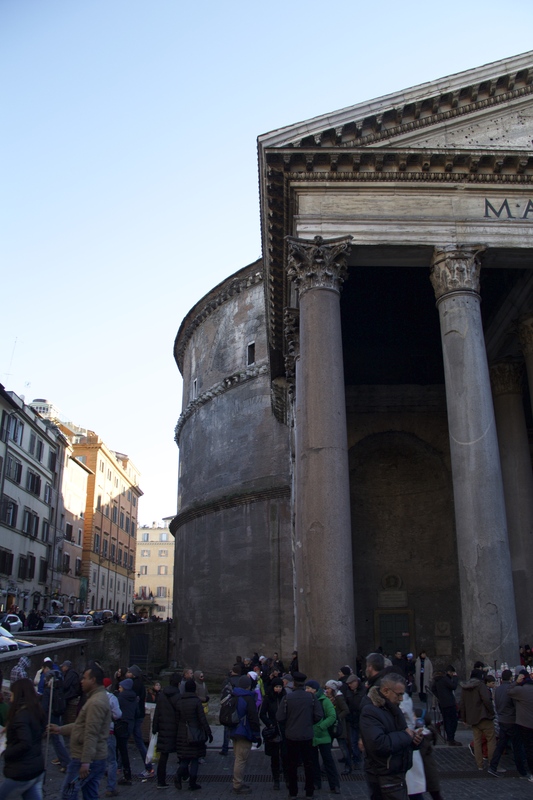 This was one of the many moments that I had in Rome when I was grateful to be visiting in the off season. Having lived in Norway for about 6 months, where the population is a mere 5 million, this was a bit overhwelming. 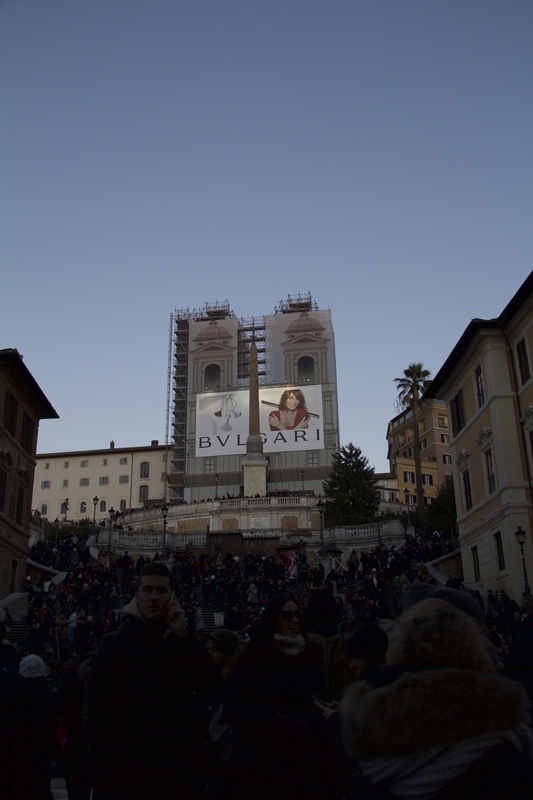 But luckily we weren’t at the Spanish Steps for very long. 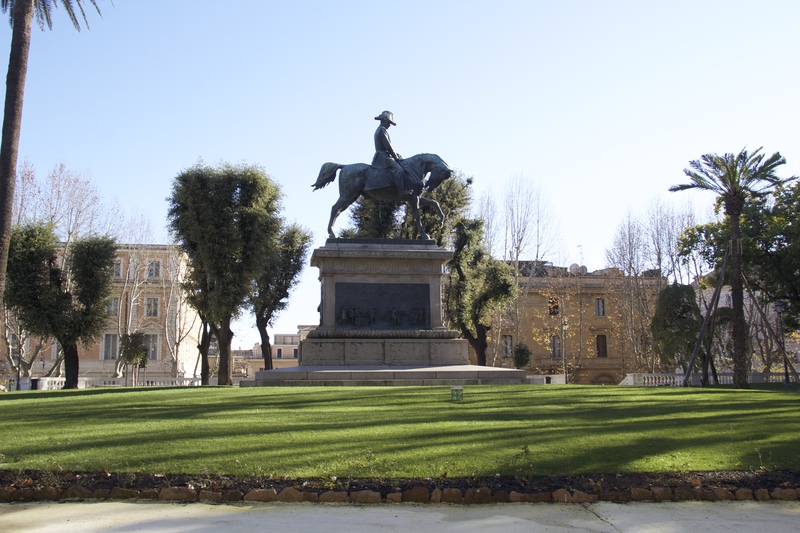 From there we walked to Piazza del Popolo where Naji led us to the Basilica of Santa Maria del Popolo. 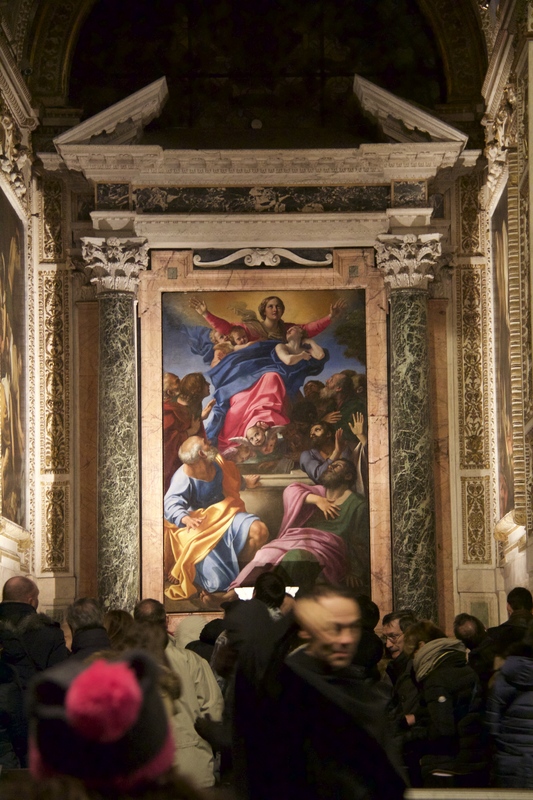 It just so happens that this church has not one, not two, but three Caravaggio’s. 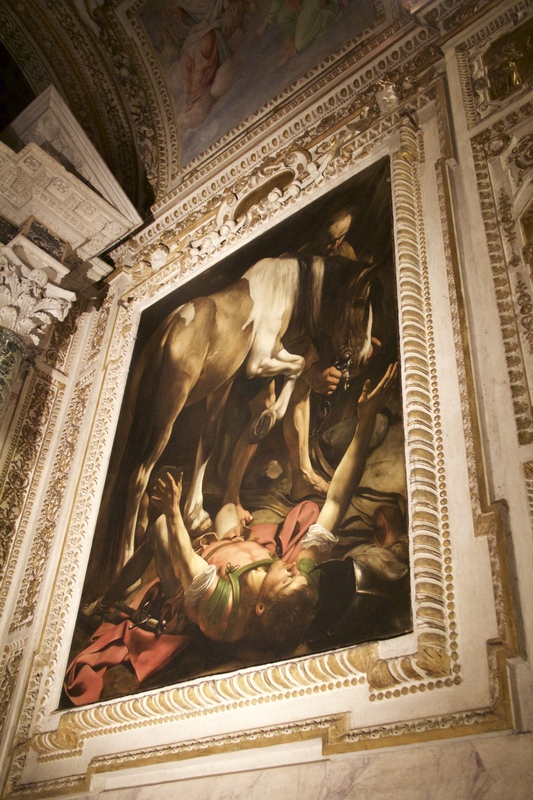 Caravaggio is one of my favorite painters so it was incredible to see these paintings. It was also great to see them exactly where they were supposed to be instead of in a museum. 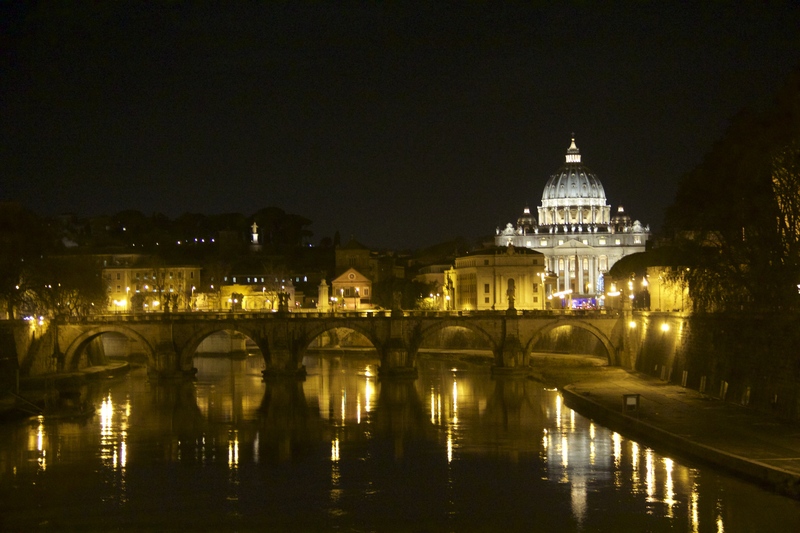 From there we crossed the Tiber River to walk towards the Vatican. 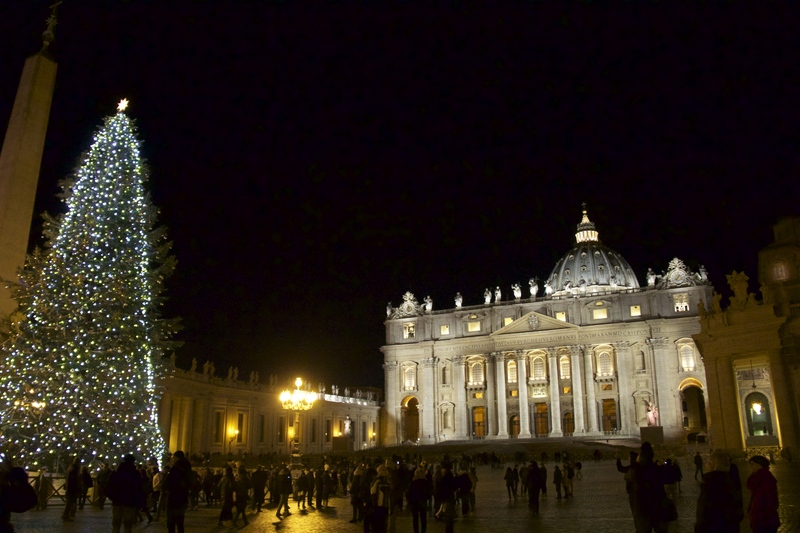 Now it just so happens that Matt’s favorite Italian restaurant, Mama’s, is near the Vatican. So we called ahead and made a reservation for 9:15 pm. 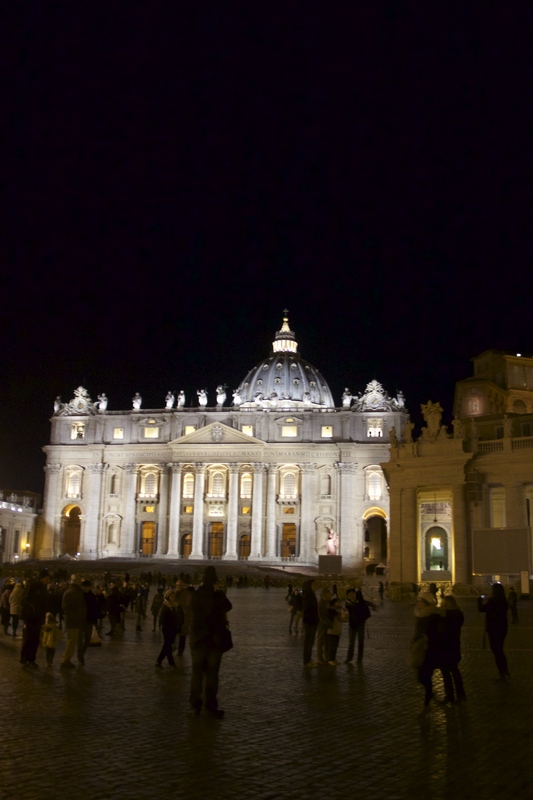 Once that was accomplished all that was left for us to do was to meet two friends at the Vatican. 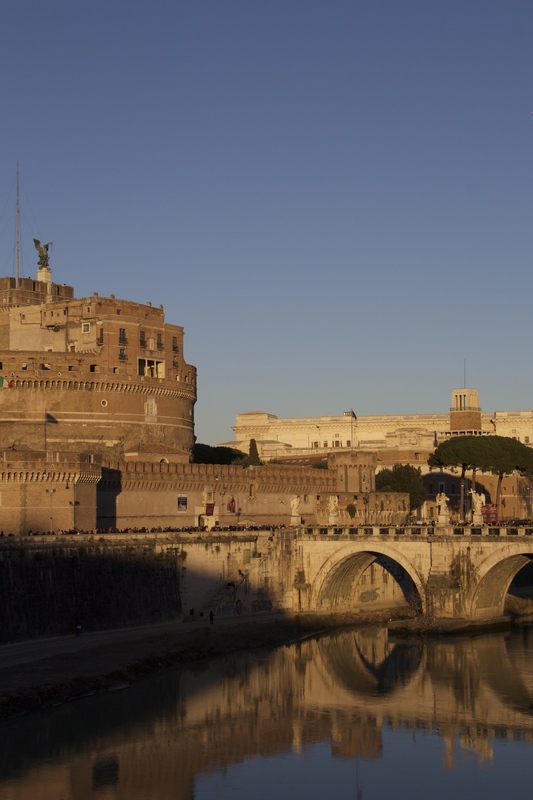 It just so happened that one of my friends from undergrad, Caro, happened to be in Rome on vacation with her family. Having not seen her for about two years, I was really excited to see her and catch up with her over dinner. 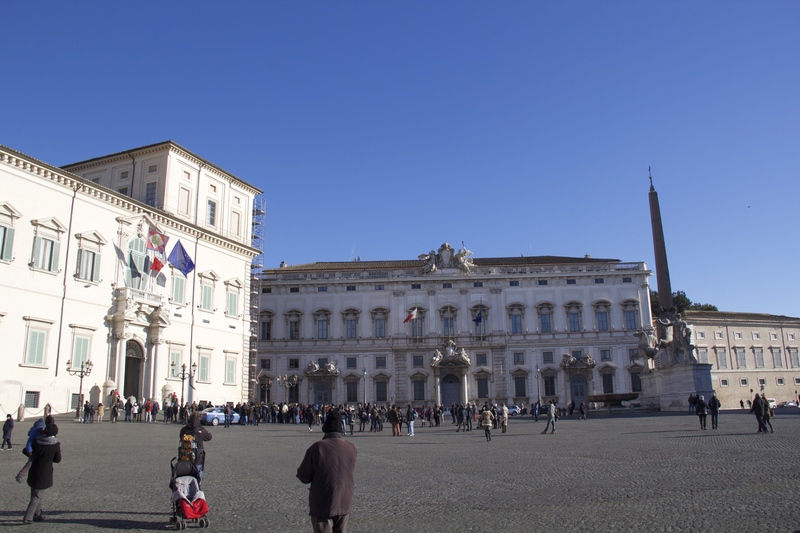 Once we picked up Caro and Iman we killed the remaining time until our reservation by walking around St. Peter’s Square and the nearby area. Eventually it was time to head over to Mama’s. To our disappointment they weren’t ready for us. Now one of the huge benefits of going to this restaurant was that Matt happens to have quite a rapport with the owner. So instead of standing outside in the cold we were invited inside. When it became clear we weren’t going to be dining in the near future we were given free glasses of prosecco. After a bit of a wait, Matt struck up a conversation with one of the waiters and managed to get the reason for the delay: there was a cardinal dining there. Apparently the restaurant hadn’t properly accounted for how long the cardinal was going to be eating and had planned on giving us the same table. We spent the rest of our time sneaking glances at the cardinal and trying to guess who he might be. Our guess is that he was an Irish cardinal but that is entirely unsubstantiated. Eventually the cardinal and his fellow diners left and we sat down to dinner about thirty minutes later. Considering that we got a free glass of prosecco and in theory some brownie points with God, I didn’t mind the wait too much. Once we were thoroughly stuffed we began the long walk home and enjoyed some of the beautifully lit up sights along the way.